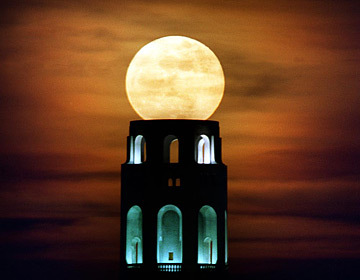 Frederic Larson is known for his fusion of natural elements with San Francisco icons, such as this shot of the moon above the Coit Tower. Frederic Larson of the San Francisco Chronicle presents "A Photojournalist's Vision," as part of the Sakamaki Extraordinary Lecture series, 7 p.m. next Wednesday at the Yukiyoshi Room of Krauss Hall on the University of Hawaii-Manoa campus. His free lecture will include images from his photo essay on World War II atomic bomb survivors in Hiroshima and Nagasaki, a finalist for the 1989 Pulitzer Prize for feature photography. Call 956-8246. Larson also will lead a five-day evening workshop, "Magic Hour at Magic Island," on capturing natural scenes at twilight. The class, July 18 to 20 and 25 to 27, includes onsite photography and computer lab work at UH. Bring your own digital or film camera. Experience using it is required. Cost is $180. Call 956-8400 or visit www.outreach.hawaii.edu/pnm. Hard Rock Cafe restaurants on Oahu, Maui and the Big Island are offering firefighters a free meal from 11 a.m. to 9 p.m. Tuesday, to celebrate the launch of a "smokehouse" menu of barbecue entrées slow-cooked in each cafe's new hardwood smoker. Because on-duty firefighters are not permitted to visit eateries that serve alcohol, all 121 Hard Rock Cafes worldwide will also deliver BBQ goodies to their nearest fire stations. In Honolulu, the Kapahulu/Waikiki station will get a break from cooking duties. Identification is required for all off-duty firefighters. Also, Hard Rock's "Crank it Up" program encourages patrons to round up their checks to the nearest dollar -- with those extra cents to be donated to the Leary Firefighters Foundation for its efforts to help provide fire stations with equipment and training. Chef Mark Reinfeld, co-owner of Blossoming Lotus Restaurant on Kauai, will introduce techniques for creating seed cheeses, pates and parfaits at the Vegetarian Society of Hawaii's monthly meeting, 7 p.m. next Wednesday at the Ala Wai Golf Course Clubhouse. Reinfeld is the author of a cookbook, "Vegan World Fusion Cuisine." The class will also be held at 7 p.m. Monday on Maui, at the Cameron Center, 95 Mahalani St. in Wailuku. Admission and refreshments are free. Call 944-8344 or visit www.vsh.org. Kaumakapili Church will host its 35th annual luau on July 15. Take-out meals, available for pick up on Kanoa St. from 11 a.m. to 5 p.m.; cost is $15. The formal luau at 5:30 p.m. features Hawaiian entertainment and costs $25. The menu includes kalua pig, chicken long rice, poi, lomi salmon, raw fish and opihi, pineapple, sweet potato and haupia.